The role of Christian and church leaders will always remembers because they have played a vital role in moulding the society in right direction- Tapir Goa. State BJP President Tapir Gao lauded the role of churches in moulding the society. He appreciated the several works undertaken by the church leaders for maintaining peace and tranquillity in state. 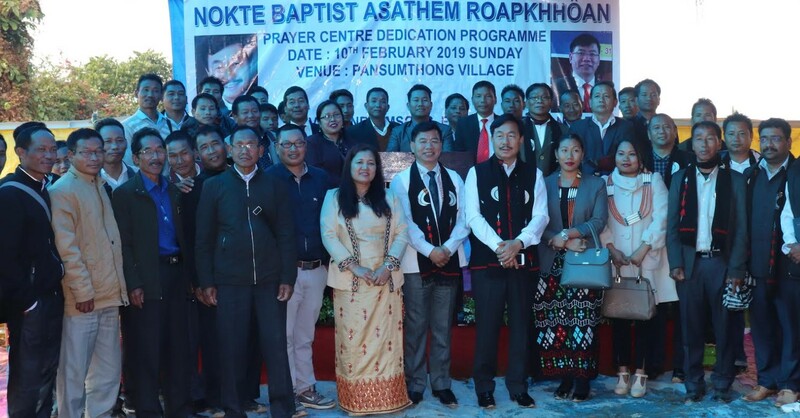 Gao was addressing the huge gathering of Christian believers on the occasion of the dedication programme of a prayer centre at Village Pansumthong of Nokte Baptist Asathem Roapkhhoan (NBAR) under Borduria circle of Tirap district. Gao said that our works need to be guided by good people and that why we should be remain god fearing so that any wrong thing are not repeated again and again. The role of Christian and church leaders will always remembers because they have played a vital role in moulding the society in right direction and now peace and tranquillity is prevailing in state due to emergence of Christianity. He emphasis the people to have tolerance and appreciated the people of Christian community for maintaining tolerance and with patience one can move forward for the unification of community and development of state. he urge upon the masses to come forward and shoulder responsibility for the development of state and country. Rubber Board former Chairman LIkha Maj in his address said that we have always been there and have always been guided by several experience people for the welfare and development of several church in state. He urge upon the people of believe in god and remain god fearing so that one can work with dedication and sincerity for the development and welfare of the family and society as well. He said that the prayer centre dedicated today should be utilised for the betterment of the community, believers and god fearing people, the centre should be utilised for the purpose of miraculous works for the suffering of the people and spiritual and devotional purpose and reformation. He inform that the Christianity have greatly influence the society and due to which there have been lots of peace, love and economic development in state. He also assured to pay all dues of the construction of the prayer centre. Earlier few yesr back Naj have paid the manor portion of the fund construction of the centre. Rev. Asenba Imsong, NBAR President Poro Bangsia, Secretary Tarun Thinok also address the gathering. while BJP Secretary Tarh Tarak, public leader Chapung Wangsu, Hangliam Sumnyan were present. Several church leaders, local public leaders, officers, youths and Christian believers among others were present on the occasion. The dignitaries also take part in prayer programme at the venue.